Our motor trade stationery is specially designed for vehicle manufacturers, dealers, body shops and service centres. With over 50 years’ experience working with the motor trade, we are a trusted and reliable business partner to thousands of automotive industry businesses throughout the UK. From dealership client files and MOT wallets to NCR forms and printed invoices, we produce and source a wide range of stationery. 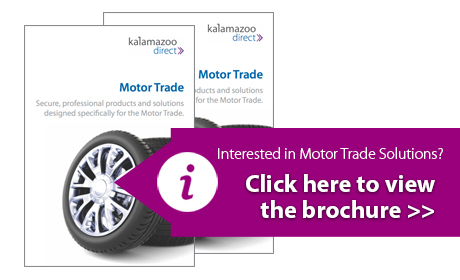 All of our products can be personalised to your organisation for an enhanced professional image, so trust Kalamazoo Direct as your motor trade stationery provider.